With over 50 per cent of its 10.5 million net additional mobile subscribers in October (over the previous month) coming from those who bought the Reliance Monsoon Hungama offer for Rs 1,097, which comes bundled with a 4G feature phone and six months of unlimited data and voice, the telco is giving sleepless nights to the market leader, the merged Vodafone Idea. The problem is simple: None of the incumbent players, including Vodafone Idea, has a similar offer to challenge Jio and ensure that its 2G customers do not migrate. 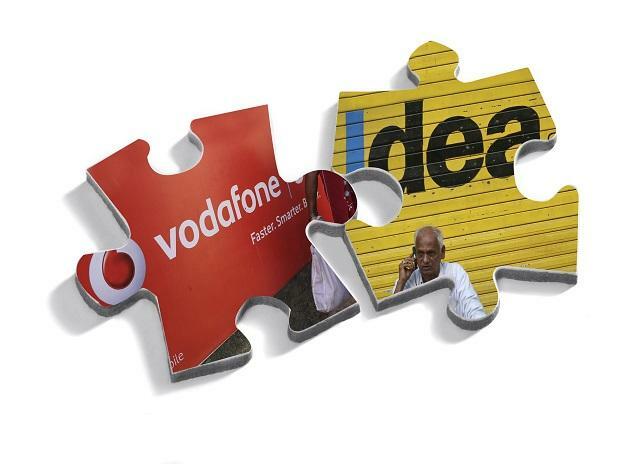 According to the Telecom Regulatory Authority of India (Trai), which declared the subscriber numbers of the merged telco (Vodafone and Idea) for the first time, the telco saw its subscriber base fall by 7.3 million customers in October. And if the September numbers of the combined entity over the previous month are taken into account, the telco shows a net loss of around 14 million subscribers in just two months. In the same period Jio added 23.5 million net customers. 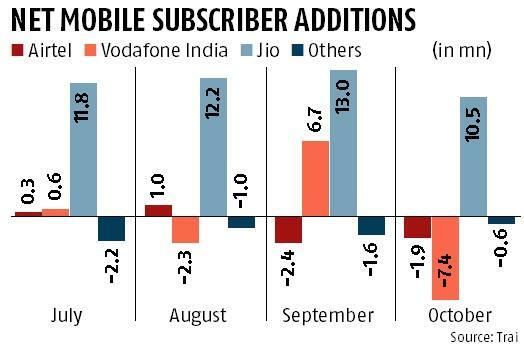 What is more worrisome for the number one telco is that Jio has been able to generate an average revenue per user (ARPU) of Rs 99 per month from these new subscribers from day one and get the money upfront. And that is higher than the blended ARPU of Vodafone-Idea, which was at Rs 88 as declared by the company at the end of September. This means Jio is grabbing Vodafone Idea’s customers from the mid end of the market, and not the lower end of their customer base. Vodafone Idea is involved in rationalising subscribers at the lower end but that is not viable in shoring up the ARPU even by increasing the minimum recharge tariff to Rs 35. Analysts point out with it losing mid-end subscribers, the desired impact on the ARPU might prove difficult. Jio’s new subscribers have under the scheme given their old phone and paid Rs 1,097, for which they have received a new 4G feature phone for a security of Rs 501 (which is returnable after three years), and a recharge of unlimited voice and data for six months. After the six-month period they have the option of recharging their phones with a coupon of Rs 49, Rs 99 or Rs 153 a month. Sources close to Jio say most of them are moving to a recharge of Rs 153. Analysts such as Morgan Stanley point out that the run rate of the net addition of Jio has been slowing. It was 9-10 million in January-June, 12-13 million in July-September and slightly lower that in October. And the positive note is that both Airtel and Vodafone Idea showed good increases in wireless broadband subscribers — 2.1 million and 1.6 million in October, respectively. And Airtel, despite the loss in net addition this October, has been able to hold on to its market share at 29 per cent plus for months together.